In a lovely bit of symmetry, the Guthrie is closing a season that began with Chekhov's Uncle Vanya with a new play by Christopher Durang that uses Chekhovian characters and themes in a decidedly modern way - Vanya and Sonia and Masha and Spike. Since I'm no Chekhov expert (in fact Uncle Vanya was the first and only Chekhov play I've seen), I'll direct you to the Guthrie's informative playbill (or online play guide) for more explanation on how the two plays are related. 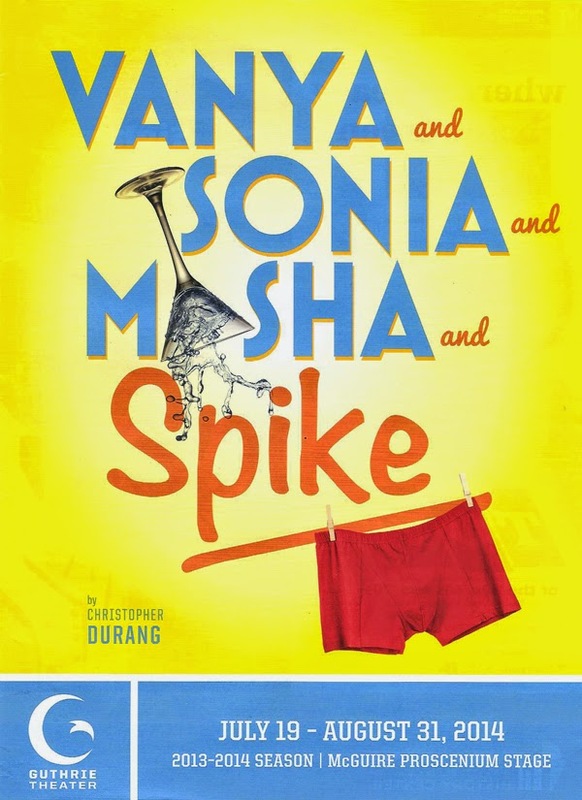 Whatever Durang's inspiration was, the result is a hilarious comedy about a dysfunctional trio of siblings and the wacky people that surround them. Even though I'm sure I missed many of the Chekhov and other references, I thoroughly enjoyed the play. It's great fun, with fantastic performances by everyone in the six-person cast. The titular Vanya and Sonia and Masha are middle-aged siblings, named by their professor and community theater actor parents after characters in Chekhov's plays. Masha is a successful actor living in New York City, and owns the family home in rural Pennsylvania where Vanya and Sonia took care of their aging parents until their death, and where they are now stuck. Masha returns home with her new boy toy Spike to attend a rich neighbor's costume party and to inform her siblings that she's selling the house and they'll have to move out. Aspiring actor Nina, the neighbors' niece, comes over to express her admiration for Masha and gets entangled in the family drama, which includes not only the costume party but a reading of Vanya's absurd semi-autobiographical play. Rounding out this group of oddballs is housekeeper Cassandra, who, like her namesake, is destined to foretell the future and not be believed. The family yells, argues, throws things, and ultimately comes to some sort of comfortable peace with each other and the fact that "their lives are over." Each one of these characters is an extreme, and beautifully portrayed by the actors to broad comedic effect, while still offering glimpses of the humanity beneath the craziness. Charles Janesz is so natural as the poor schlub Vanya, who seems like the calm normal one until he explodes in an exasperated second act rant about the good old days, perfectly delivered so that it seems like he's saying these words for the very first time. The ever hilarious Suzanne Warmanen brings much humor to the role of the long-suffering and melodramatic Sonia, and also makes you sympathize with Sonia as she experiences rare hope (and she does a great Maggie Smith impression). Candy Buckley parades around the stage with all the bravado and self-centeredness of a "movie star." She has this guttural way of emphasizing words that's almost over the top, except that it works and it's hilarious. Boy toy Spike is just what you'd expect, a perfect exterior with not much going on underneath, and Joshua James Campbell (a familiar face from other local stages making his Guthrie debut) plays this vain character with absolutely no vanity, strutting around the stage in various stages of undress. Watching the other characters' reactions to Spike is almost as much fun as watching him (this is not the first time Josh has stripped, or reverse stripped, onstage, anyone remember Theater Latte Da's The Full Monty?). Ali Rose Dachis is all sweet innocence as Nina, a ray of sunlight in this grumpy family. Last but not least, Isabell Monk O'Connor brings great and gleeful energy to Cassandra, snapping into and out of her prophetic statements as if in a trance. Unlike his gigs at the Jungle where he also designs the set, Joel Sass merely directs here, keeping the hilarity moving but not getting out of control. Todd Rosenthal gets the credit for designing the lived-in, comfortable country home, with community theater posters on the wall and tchotchkes on the tables. 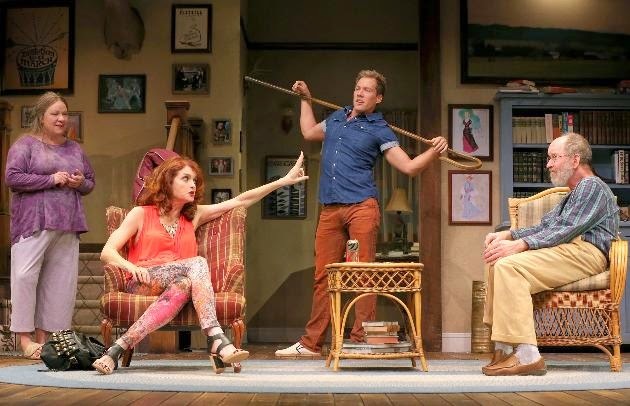 Vanya and Sonia and Masha and Spike is a play that doesn't take itself or its characters too seriously, even poking gentle fun at theater itself. Spending an evening with these crazy characters is great fun, and a pleasant end to another wonderful season at the Guthrie (playing through August 31). This article also appears on Broadway World Minneapolis.